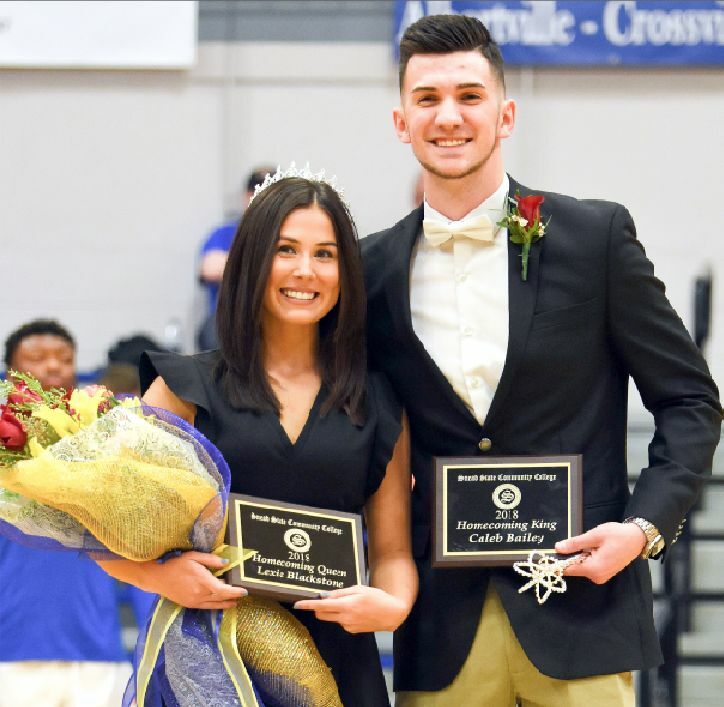 Sophomores Lexie Blackstone of Albertville and Caleb Bailey of Crossville were crowned the 2018 Snead State Community College homecoming queen and king Feb. 12. Eight freshmen and 10 sophomores were voted to Snead State Community College’s 2018 homecoming court. Members of the court are (not pictured in order) sophomores Lexie Blackstone, Sadie Brock, Abigail Rose Cheek, Lily Hawkins, Joy Grace Webb, Caleb Bailey, Jacob Coker, Payton Childers, Chance Fisher and Payton Youngblood and freshmen Beth Buckelew, Allie Jett, Emma Roberts, Madison Nicole Self, Matthew Butts, Nathan Cornutt, Cameron Preston and Hunter Preston. The court was recognized during the Feb. 12 basketball games against Shelton State. Sophomores Lexie Blackstone of Albertville and Caleb Bailey of Crossville were elected as the 2018 Snead State Community College homecoming queen and king. Blackstone and Bailey were crowned between the women’s and men’s basketball games Feb. 12 at Plunkett-Wallace Gymnasium. The Parsons defeated Shelton State 96-91 in the men’s game. The Lady Parsons lost to the Lady Bucs 98-72. Eight freshmen and 10 sophomores were selected to serve on Snead State’s homecoming court. Representing the sophomores were Blackstone, Sadie Brock of Albertville, Abigail Rose Cheek of Albertville, Lily Hawkins of Crossville, Joy Grace Webb of Albertville, Bailey, Jacob Coker of Southside, Payton Childers of Boaz, Chance Fisher of Huntsville and Payton Youngblood of Birmingham. Representing the freshmen were Beth Buckelew of Guntersville, Allie Jett of Fort Payne, Emma Roberts of Boaz, Madison Nicole Self of Boaz, Matthew Butts of Blountsville, Nathan Cornutt of Boaz, Cameron Preston of Mobile and Hunter Preston of Mobile. Blackstone is the daughter of Kim and Larry Blackstone. A 2016 graduate of Albertville High School, she plans to earn an associate degree in business from Snead State. She is the secretary of the Student Government Association, vice president of fellowship for Phi Theta Kappa, president of Student Ambassadors, publicity chair of the National Honor Society of Leadership and Success, a member of Phi Beta Lambda and Sigma Kappa Delta, a student tutor for the Academic Success Center and a presidential scholar. She is a Bible study leader for third and fourth grade at Crossville Baptist Church. She plans on pursuing a bachelor’s degree in marketing from the University of Alabama after graduating from Snead. Bailey is the son of Karen and Dale Bailey. He graduated from Crossville High School in 2016 and is currently a presidential scholar. He plans to earn an associate degree in social studies. Bailey is a member of Student Ambassadors and Phi Theta Kappa. He plans to transfer to Jacksonville State University in the fall to pursue a bachelor’s in business administration and social science education.